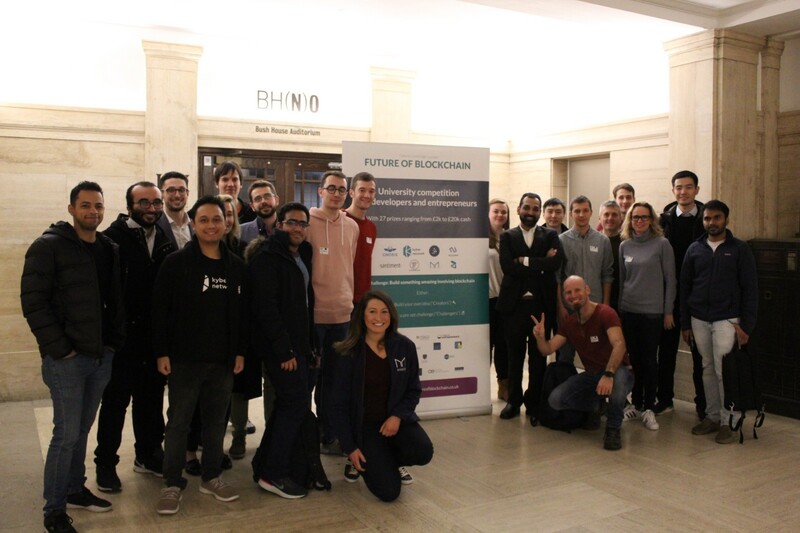 On Tuesday 19th March 2019 at Bush House, Kings College London, Future of Blockchain’s first cohort came to a close with a finale pitch event. 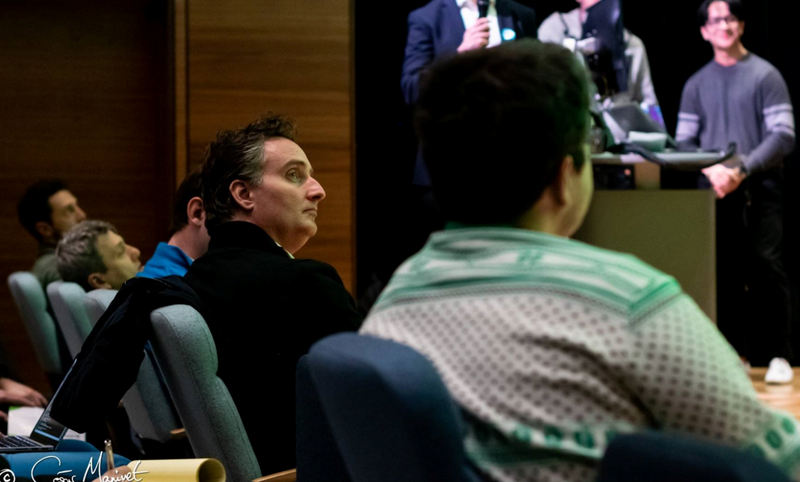 Twelve finalists pitched for a £20,000 cash prize in front of a packed audience of esteemed judges, investors, developers and other competitors. We were delighted to share the evening with the project demonstrations of Patrick McCorry’s Cryptocurrency Class which has been running over the last 10 weeks. The class, run with support from Antonio Sabado’s Work on Blockchain, has attracted over 400 developers and enthusiasts to attend on a weekly basis. Future of Blockchain is a 3 month competition to build something amazing involving blockchain. It is aimed at researchers, students and alumni from the leading universities in the UK. For this iteration, we worked with the Universities of Oxford, Cambridge, Imperial, LSE, UCL, KCL and Queen Mary’s. FoB is an initiative of StakeZero Ventures, a European VC investing in blockchain. 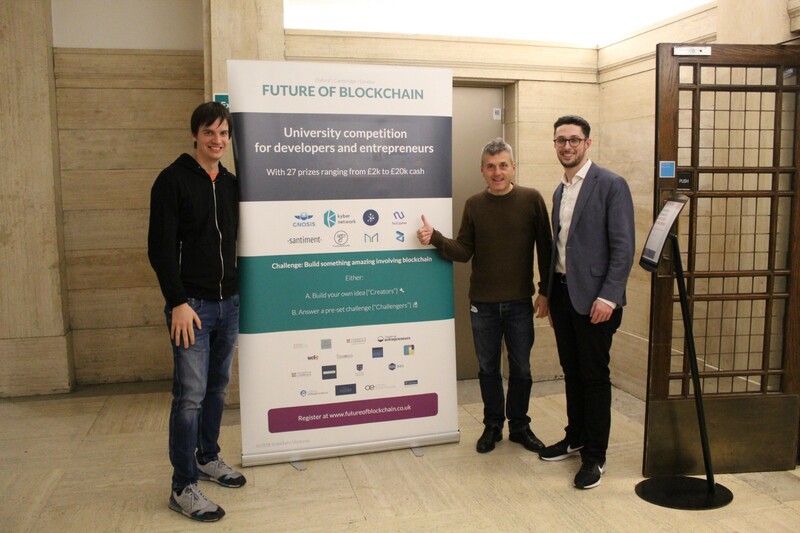 We run FoB to add value to our network and investments, to access projects coming out of the top UK universities and access an untapped market for blockchain developers: university researchers and students. Participants could choose between building a Partner Challenge or doing their own idea (Creator Challenge). For the Partner Challenge, participants could build on one of eight platforms who kindly supported this cohort: Gnosis, Kyber, Liquidity Network, MakerDao, Nucypher, Santiment, Thunder, Zilliqa. More details on the challenges they offered are available via this link. For the Creator Challenge, participants could build anything they liked, be it a startup, a tech project or research. Over the 3 months, we ran meet-ups and workshops in each city on a bi-weekly basis. We also touched base with every applicant who wanted feedback or advice via 1–1 meetings and calls on a regular basis. By the end of the competition, we asked participants to demo what they build and send in their codebase for assessment. In all, we had 160 teams and over 600 students participant from across the seven partner universities. These teams were made up of alumni, post-docs, PhDs, Masters students, MBAs, undergraduates and much more. Lee Pickavance, Managing Director at Consensys. James Devlin, Associate at Eight Roads. Patrick McCorry, Assistant Professor at Kings College London. Lyuben Belov, Partner at Stake Zero Ventures. Built by a team of four from Imperial with a trading background, Block Scholes offers on-chain derivatives for individuals to hedge their digital assets to eliminate counterparty risk. Built by a team of six, Commit-Me was formed when the group met at an Alan Turing Institute workshop. It is a platform for tracking social impact commitments and is currently being piloted at Oxford University. The platform uses Dai for funding pledges. Built by an individual, Comparethemarketcap uses Santiment’s data for an interactive web application that lets you compare metrics of a large selection of digital assets. Built by one of Professor Ross Anderson’s PhD candidates, dMapp is a privacy respecting, decentralised, incentivised navigation and mapping service. It is especially aimed at the thirdworld where routing in slums, favelas and small villages is rudimentary. DMapp uses Zilliqa for micropayments and as a trusted store for integrity checks. Built by a team of three KCL Computer Scientists, DxInteracts is an open-source layer running on top of Gnosis’ DutchX decentralised exchange, easing user interaction. Built by a team of three from Cambridge, Hypervault is a flexible, decentralised, platform-agnostic file access-control system powered by a permissioned blockchain. The platform uses Nucypher as the fundamental cryptographic scheme to encrypt private keys. Built by a team of four from Imperial, Liquidity Stream uses Liquidity Network’s NOCUST protocol for pay-as-you-watch-video-on-demand. Built by a team of two from Oxford who met at one of the FoB Launch events, Mimicstream is a ‘decentralised Twitch’ that uses the Kyber Network to allow users to tip content creators and live stream directly without any centralised service fees. Built by a team of two from Cambridge, ParityGame is a game studio and platform for buying NFT accessory items for games. Through a Thundercore integration, the platform provides game users with a more efficient game asset trading. Built by a team of two from Oxford and Thailand respectively, Trustless Bank is a Lightning Network and Ethereum Plasma wallet for multiple coins allowing coins to be swapped with other users via atomic or cross-chain swaps. Built by a team of four from Oxford including a cancer doctor, Dconsent uses Thundercore to manage individual’s consent to the use of their data online on the blockchain in real-time. FoB 2 will start in September bigger and better. We hope to be expanding to Edinburgh, Manchester, Bristol and more universities. We will be also running a Career Fair as well as number of developer workshops and events across the UK. First, thank you to Patrick McCorry, Antonio Sabado, Work on Blockchain and the whole Cryptocurrency Class team for sharing the evening (and venue) with us. We are indebted. Thank you from all the StakeZero team…roll on FoB 2!